Another project for ASB Group with the launch of Dine-around.eu. 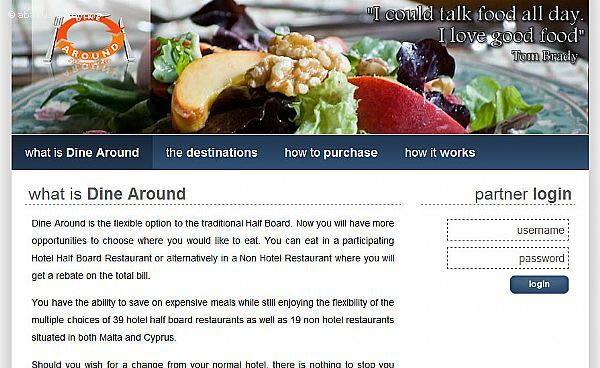 Dine-Around.eu is the website for the a business concept that has changed the Half Board concept, whereby tourists have the opportunity to chose where they would like to eat as long as the place they chose is a participating Hotel Half Board Restaurant or a participating Non-Hotel Restaurant. Participating in Dine-Around are an array of hotels and restaurants in Malta and Cyprus. The website targeted for the individual traveler includes all the information about the Dine-Around product and how one can purchase the Dine-Around card and all the information about the hotels and restaurants participating in the Dine-Around concept. Visit the website here.